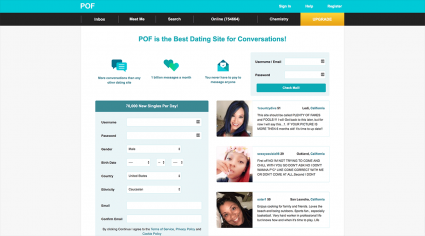 Overall, Plenty of Fish is an effective dating website for those looking for a large dating pool. It boasts over 90 million users. Additionally, this site can suit all individuals, including those in the LGBTQ community. While the free messaging can be difficult find, it works well and getting matches seems simple. Plenty of fish offers a large dating pool. This can be a great asset to people who live in small or rural areas. It also means you have a greater chance of making a connection. You can send and receive messages without upgrading to a paid membership, which is is a necessity for any free dating site. Advanced search allows you to filter based on profession, personality, education, and other criteria. It offers a free chemistry assessment with more than 70 questions in various aspects of personality to help you find top matches. It also offers other personality questionnaires you can complete, such as a relationship needs questionnaire to help you assess what you need in a relationship. An app is available for iPhone and Android. This site offers a basic match algorithm. Therefore, you have to search to find your specific matches. There is also no way to confirm your identity so anyone, including spammers, can create a profile. It doesn't offer a chat or video chat option as some paid sites do. The registration process is extensive and can take time. To block another user from contacting you, you must already have a message in your inbox from them. As far as free online dating websites go, OkCupid makes it pretty easy. While setting up your profile is an exhaustive process, you can get a high number of matches. Additionally, when you set up your profile, you can clarify what type of relationship you are seeking whether it be a hook-up or long-term dating. Additionally, this site can cater to non-traditional genders and others in the LGBTQ community. The design of the site is simple, yet surprisingly edgy. It's fun to use, and finding and accessing the features is easy. It uses an algorithm to match you up with potentials. Messaging and interacting on the site are totally free. It offers a mobile app for Android and Apple products. Messaging doesn't come from just any user on the site; it only comes from people you've liked because of a major overhaul in 2018. It allows you to specify what you are looking for. If you live in a smaller community, you might not find many matches nearby. Since anyone can create an account, spammers are a possibility. Signing up can take as long as 30 minutes if you fill out everything. Tender Singles allows you to see who likes you and who visited your profile. It also allows you to chat with others. The profiles are expansive, but the dating pool is small. Additionally, the design is simple, and it works on a search and find without using specific matching algorithms so you find your own matches. The site does not find them for you. It's easy to use. All the buttons and headers are readily available. Tender Singles allows you to search based on relationship type whether you are looking to hook-up or date long-term. It includes in-depth profiles you can view for potential matches. Signing up only take a few minutes. The website doesn't use extensive algorithms like some other sites. You are your own matchmaker. Anyone can message you. You have to watch for spammers. No online chat room feature is available. Mingle 2 is a large dating website that offers all of its services for free. 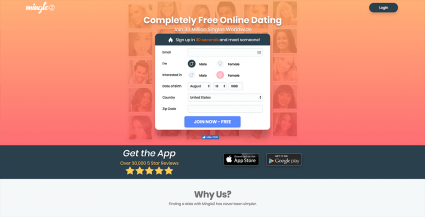 If you are into quick and easy, this might be your dating website since the sign-up only takes about 30 seconds. The site is effective in helping you find people in your area and can give you some nice matches. However, you are basically on your own. Unlike OkCupid or Plenty of Fish, there aren't any extensive questions to answer. Instead, mutual matching and searching can help you find a person interesting to you. Everything from messaging to who is viewing your profile is free. The sign-up process is very easy. The website has an extensive list of users. It offers an app for Android and Apple products. The search feature offers extensive options. Only completed profiles are viewed. The online ads distract from the site itself. Sometimes, you aren't exactly sure what you are clicking on. It has no chat rooms. The website is picture heavy. There isn't much to several profiles so you have to rely on images. Online dating is a big business. There are, however, several websites that offer free online dating services. While some will offer premium memberships, viewing profiles and chatting are completely free.